The process of hand painting glass is often seen in churches, where the figurative details of Saints and various biblical scenes are depicted with a realism enabled only by the hand painting process. 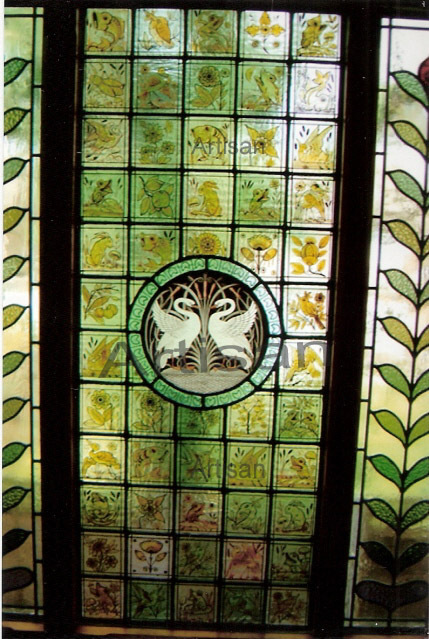 The term stained glass truly relates to the hand painting, and staining, process, and it is for this reason that the true art of stained glass, when used in a domestic setting, was reserved only for the best homes. 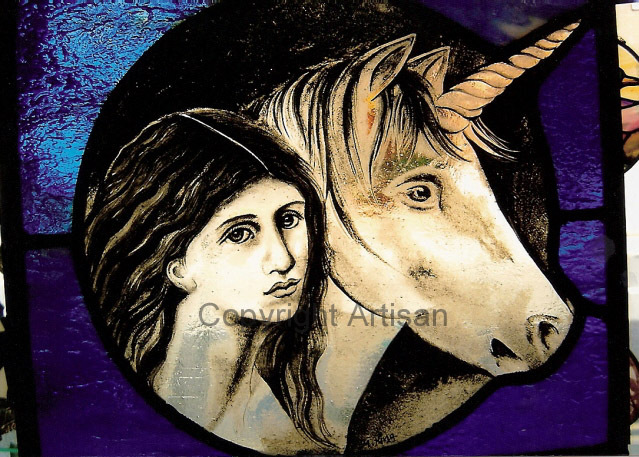 At Artisan (genuinestainedglass.com) we design and make leaded panels that can include hand painted detail for both private and trade clients. The kiln firing method we employ is exactly the same as original craftsmen and women have used for hundreds of years, and is a permanent and traditional way to add fine detail to stained glass windows. 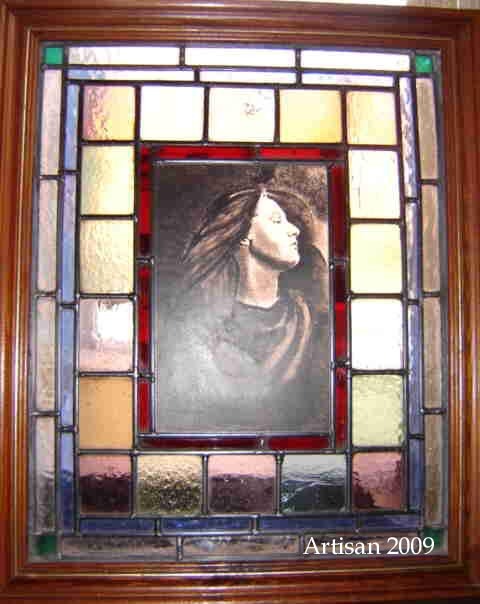 The hand painted stained glass service we offer. 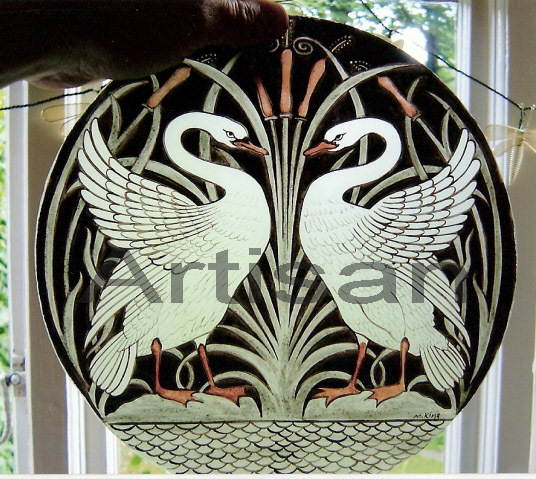 Below are examples of the hand painted stained glass service we at Artisan offer to both public and trade clients. 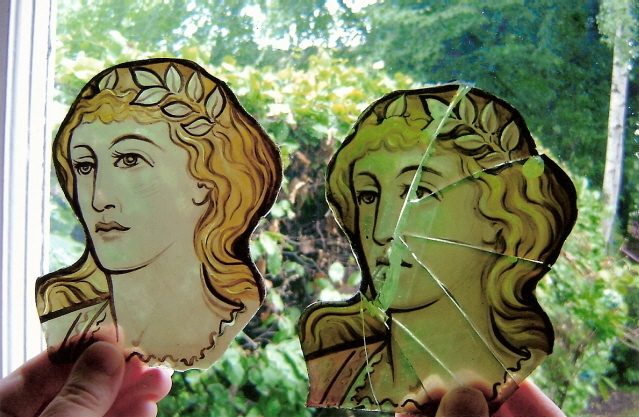 The face of the figure of Ceres, goddess of agriculture was broken into many pieces and so we hand painted a new face on matching glass using exactly the same process and skills as the original artists. This included three firings in a kiln to make the paint permanent. The pieces were then inserted into the leaded window and sealed to restore it to its original glory. Trade client. 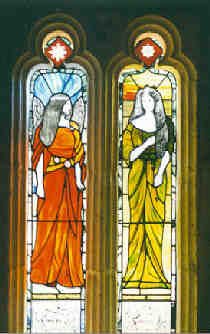 Below: On the left is an example of a large decorative piece of antique stained glass painted by Artisan to replace the broken original (below right). Produced for a trade client. Below shows the process of hand painting the centre of a stained glass window for a private client. 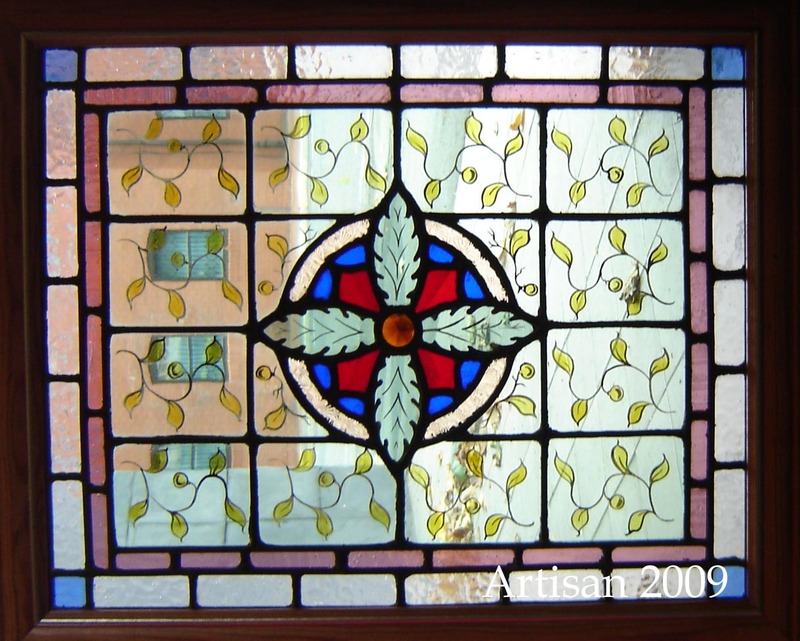 On the left is during the painting stage, the centre shows the finished painted centre and the right depicts the finished stained glass window hand made by ARTISAN. 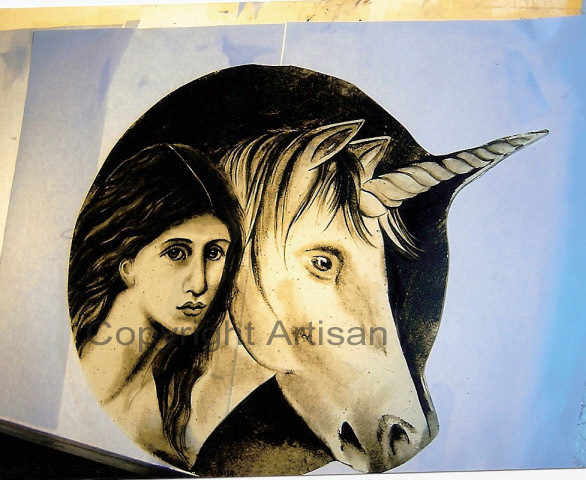 Above: A new design by Artisan for a farmhouse in Wales featuring a Unicorn and maiden. 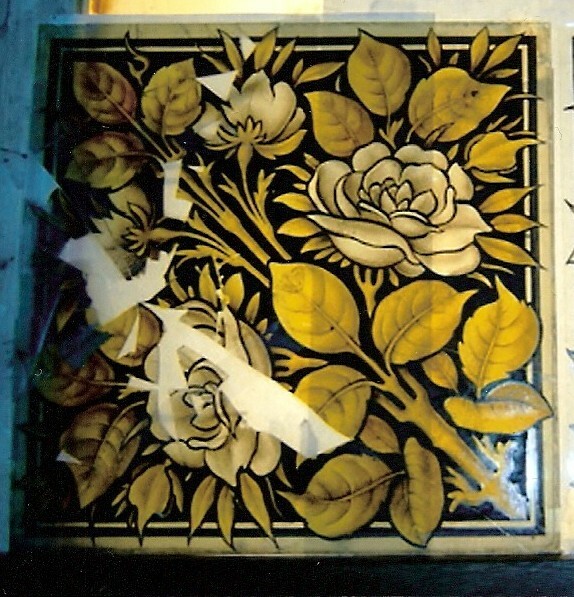 The picture on the left is in the process of being hand painted before kiln firing, and on the right shows the painted glass leaded into the finished window. Copyright artisan2012. 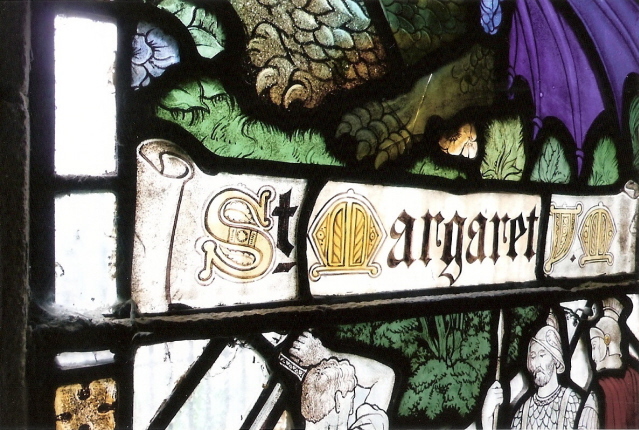 Above: The 'Margaret' piece is newly painted by Artisan in 2012. This was hand painted and fired in the kiln three times to exactly reproduce the original broken piece, then inserted on-site into the stained glass church window. 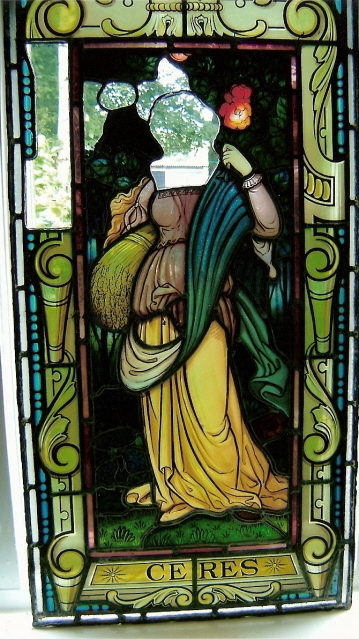 Above: A stained glass window with a hand painted centre of a lady. Size apporx 500mm X 400mm in a decorative wooden frame ready for hanging. Call Tom on 079786 832 323 for more info. Above: For sale. One newly made hand painted stained glass panel in a decorative wooden frame ready to hang. Designed and made by Artisan using completely traditional techniques. Approx size 500mm X 400mm. As seen on BBC TV. 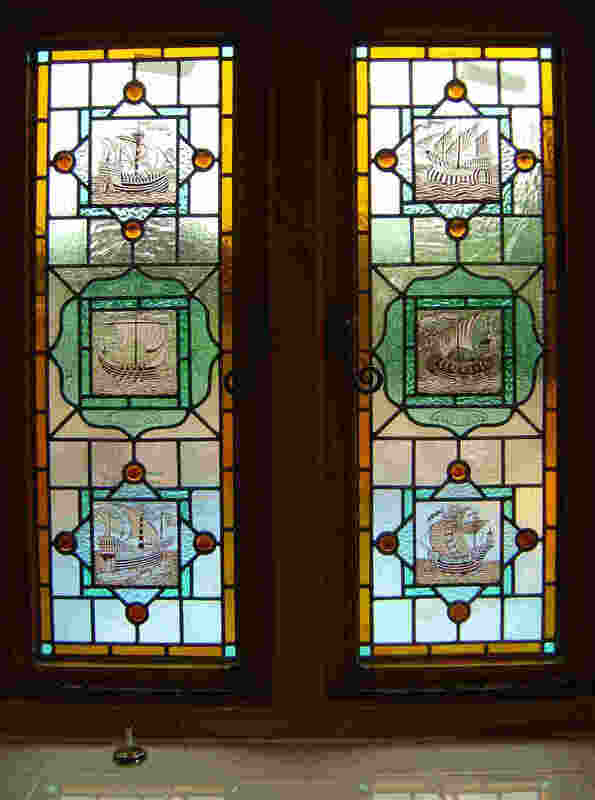 A pair of windows featuring a galleon design, made by Artisan for an Arts & Crafts house in Cheshire. Set ofsix hall panels in the Isle of Man designed and produced for a private client in 2002. 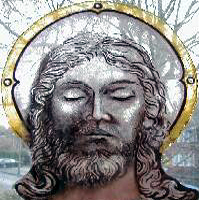 Face of Christ painted for church restoration. Commercial client. left - Pair of new panels designed and fitted by Artisan for a private client in South France. Left: An Artisan hand painted domestic front door centre, before leading into window. 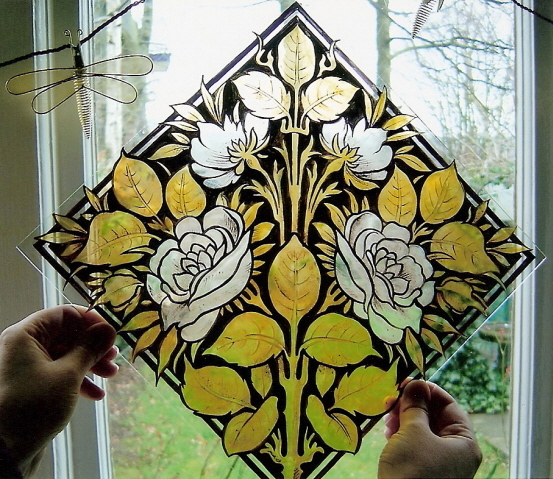 Artisan designed and made Stained Glass panel made for a client in Knutsford, Cheshire. 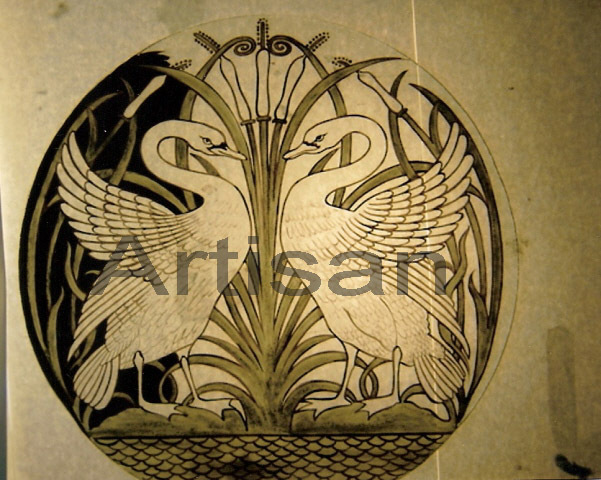 At Artisan, when we design and make new stained glass, we take great care to match colours textures and design to be as authentic as possible to the era in which the building was designed. Twenty five years experience of making and restoring traditional leaded windows means we produce panels that belong in an environment rather than dominate. The skills and techniques employed are exactly the same skills that has produced the stained glass in our cathedrals and churches for hundreds of years. We do not produce any works that involve modern imitation methods (as often seen on some plastic conservatories) whatsoever.